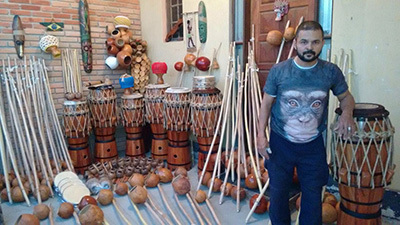 Eduardo Rodrigues, well known in the Capoeira scene as Mestre Negão from São Paulo, has become one of the very important characters in Capoeira, mainly through his Capoeira event ‚Vadeia Samba’, but also with his high-grade artisanal instruments and his very kind personality. He constantly tries to connect capoeiristas from differnet styles and groups. 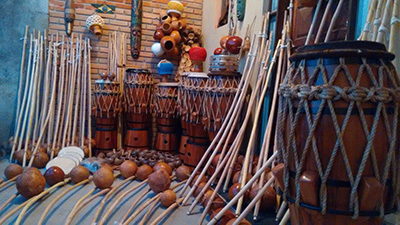 He has his workshop in São Paulo - no more than a single room in a small house, this is where he makes his instruments. His atabaques are of exstremely good quality and his artisanal skills create demanding and beautiful instruments with traditional rope tuning systems. His berimbaus are all ‚casados‘ - married. A married berimbau is especially precious and always a unique piece of high value, elaborately manufactured with hand-picked matching components. In order to find a beautifully sounding combination, a long search is necessary and despite having much experience, it is inevitable to try many combinations before successfully finding the perfect match. For this reason it is called ‚the wedding’, when finally all parts go together well. Mestre Negão also matches up baterias, sets of 3 differently tuned berimbaus - all of them casados and with harmonising tuning within the trio. The 3 berimbaus harmonise with one another are always tuned and played together. Anyone teaching Capoeira should have such a bateria and take good care of it. Only for special events the precious bateria is brought out and played.